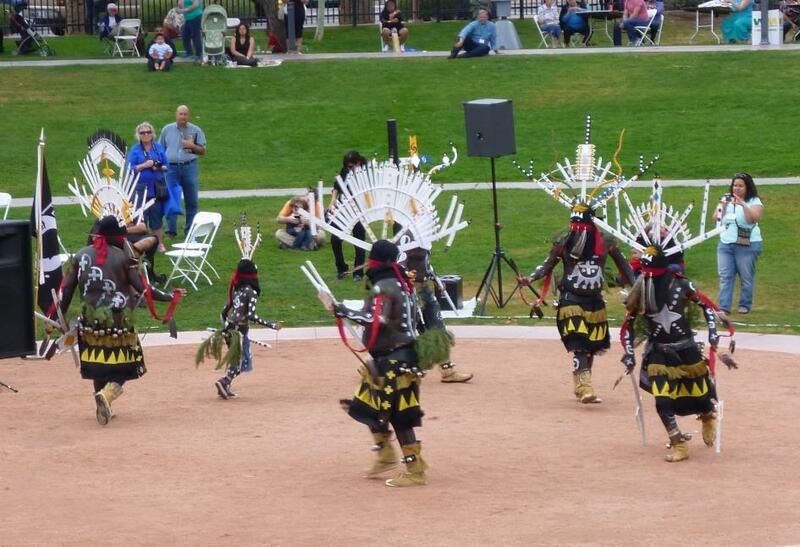 In Phoenix: The Heard Museum of Native American Art. This museum is fascinating, exhaustive, instructive and almost overwhelming in the size of its collection and the detail in which it explains the many culuture of Native Americans of Arizona. Fortunately, we had a time limit. We focused first on a special exhibit of Georgia O’Keefe paintings of the Southwest. This was on its last day, but if it is a sample of the quality of special exhibits at the Heard, I would suggest you pay attention to whatever is being featured on your visti. Of the Heard collection I was most fascinated by the collection of kachina dolls donated by the late Senator Barry Goldwater, maybe because as a child I was given a Kachina doll by a visiting relative. Learning the stories and symbology of these artifacts could have enthralled me for the entire afternoon. Another bonus which lured us back outside was the Annual Indian Market and Fair, featuring Indian dancers in elaborate Hopi feather costumes and juried Indian art. If you go to the Heard and need a break from all that culture, I can recommend their lunch restaurant. We ate tacos and Mexican salad in the plaza – a lovely, lively setting. About half-way to Sedona you’ll need a rest stop. 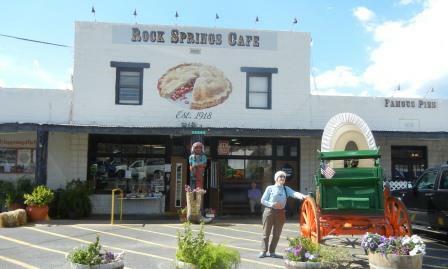 The Rock Springs Café offers deservedly famous pie: a killer lemon meringue, pecan pie made with Jim Beam, plus serviceable salads, burgers, and homey fare. And a stuffed polar bear in the gift shop. Montezuma’s Castle National Monument – this small but fascinating park features a 5 story cliff dwelling, positioned high on a cliff overlooking a lovely sycamore-lined creek. The visitor’s center is a fine introduction to the site, and the stroll on the loop trail looking up at the mysteriously abandoned structure is a welcome break to the highway. Once you get to Sedona, you’ll need to get in tune with the New Age vibe, so you better seek out a good Vegan restaurant. I can recommend Chocolatree, an unpretentious combination restaurant and chocolateria along the road west from the main Y intersection. My less-adventurous companion was dubious bout the tarot cards on the table, but ate every bit of her black bean chili. My Meatless Mushroom Medley was gray but yummy. The Mediterranean Madness ordered by my other fellow traveler -quinoa, almonds, raisins, sunflower seeds, coconut milk, and more- was too rich to finish. Still we managed to share a Chocolate Ganache of dates, raisins, macadamia nuts, coconut milk, and raw cacao, but we had enough leavings to share the next night with a table of 8 and it went around twice. Sedona started as a Mormon mission; then came the miners, whose main remnant is the picturesque semi-ghost town of Jerome dangling from a bluff across the valley. Then came the New Agers, with their crystals, their ethnic garb, their peculiar dietary restrictions, and their talk of mystical vortexes of energy to be found among the red rocks. With the skyrocketing prices of precious metals, there is a current threat that old mines will be opened and subjected to new tech hydraulic mining, starting the cycle over again. 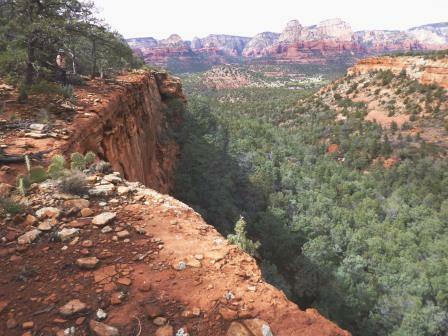 But meanwhile, visitors continue to be magnetically attracted to Sedona, whether it is vertical energy or simply the stunning scenery and space. 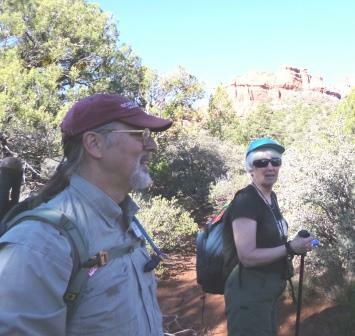 I am part of a group of nineteen who have signed up for five days of hiking in the Sedona back country. Our hike leader is a former lawyer who was involved in environmental cases and must have asked himself the Big Questions: WHY am I doing this legal work which I don’t t enjoy? WHAT IF I quit and went to work for Roads Scholar? HOW can I make it work? He found a niche as a faculty member at Northern Arizona State University solely employed in facilitating hikes, conventions, bonding sessions, and so on for the U. Is this a cool job or what? A second guide is also a strong believer in the power of vortexes. 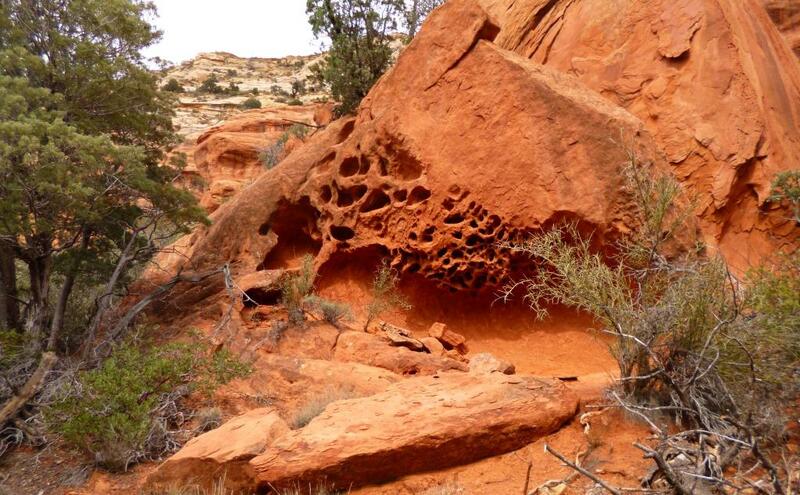 We stood in the center of a natural amphitheater in the rocks, purportedly a vortex site, and he told us of meeting a Native American at this site where he was meditating. The Indian pulled out a conch shell from his pack and, after asking permission blew a deep note. The sound traveled in a circle around them as it echoed from one wall to another, a truly mystical moment. We tried to believe, but we could not reproduce any mysterious effects of the vortexes. We ate delicious food in a vegan restaurant, and felt just as stuffed and no healthier than if we had over-indulged at McDonald’s. 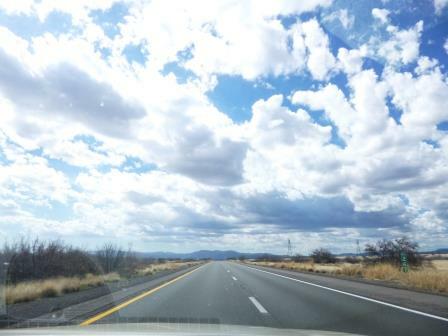 However, the drama of the soaring rocks, the rippling streams, and the blue sky soaring to forever was enough to energize me without benefit of crystals or magnetic fields. Just being with beauty makes you more aware of what being means.